Aira technology brings enriched experience to USABA Marathon National Championships with sponsorship. For years, technology has made the world more accessible. From accessible technology and access tools like screen readers, cell phone apps, and scanners, we’ve seen technology that have forever changed the day-to-day tasks for the blind and visually impaired. One of the most recently developed technologies is Aira. Aira, a service that connects blind and visually impaired people to highly-trained, remote agents, is available through a smartphone app or through an optional pair of Horizon Smart Glasses. 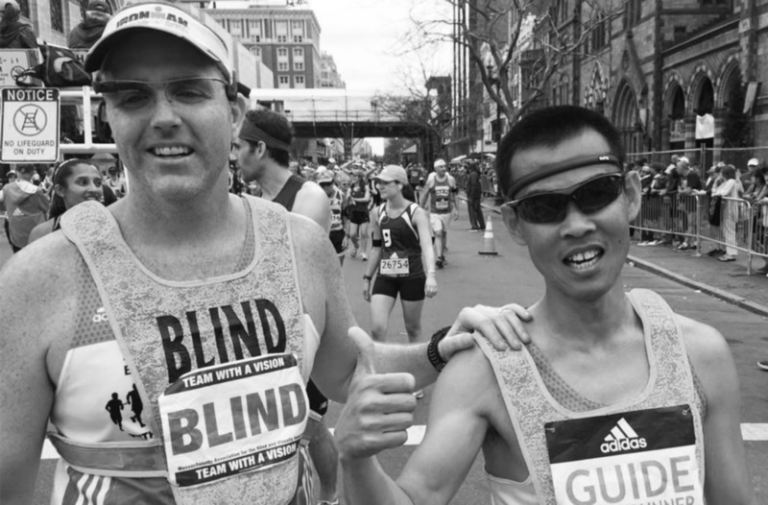 Visually impaired runner Erich Manser ran the Boston Marathon with a guide and with the assistance of Aira technology. Erich is pictured on the left wearing a camera on glasses which captured images and transmitted them to his Aira Explorer for audio description. Affectionately called “Explorers” by the company, Aira delivers on-demand access to visual information at the touch of a button, filling in many of the blanks experienced by Explorers and enhancing everyday efficiency, engagement, and independence. “I use Aira a lot during travel, working out, administrative tasks like paperwork and forms, and things like that,” Aira user and U.S. Army Veteran Tim Hornik said. Hornik, who became blind after a sniper shot him in the head while on patrol in November 2004, medically retired from the U.S. Army in December 2011. He is the founder and CEO of Blind Not Alone LLC, the Blinded Veterans Association’s Director of District 2, and assists Aira with their Veterans Affairs integration efforts. For the past year, Hornik has worked with Aira to introduce the technology to the U.S. Department of Veterans Affairs as part of their rehabilitation services for blind and visually impaired veterans. When it comes to running, Aira is not meant to replace a sighted guide, white cane or dog. Aira enhances your experience throughout training and race day, from describing water stations, signs along the race course, what the crowd is looking like, and more. This allows runners to have added direction for safer crowd navigation and a richer experience overall. As part of the Blind Veterans relay team, Hornik and Bernal are teaming up as a runner-sighted guide pair to complete half of the USABA Marathon National Championships at the California International Marathon on Sunday, December 2 in Sacramento. The California International Marathon has served as host to USABA’s annual Marathon National Championships since 2008. Veterans interested in learning more about requesting Aira from the Department of Veterans Affairs can visit www.aira.io/veterans. To learn more about Aira, visit www.aira.io.